What is this course about? Who are the instructors? Who are you? What do you expect from this course? 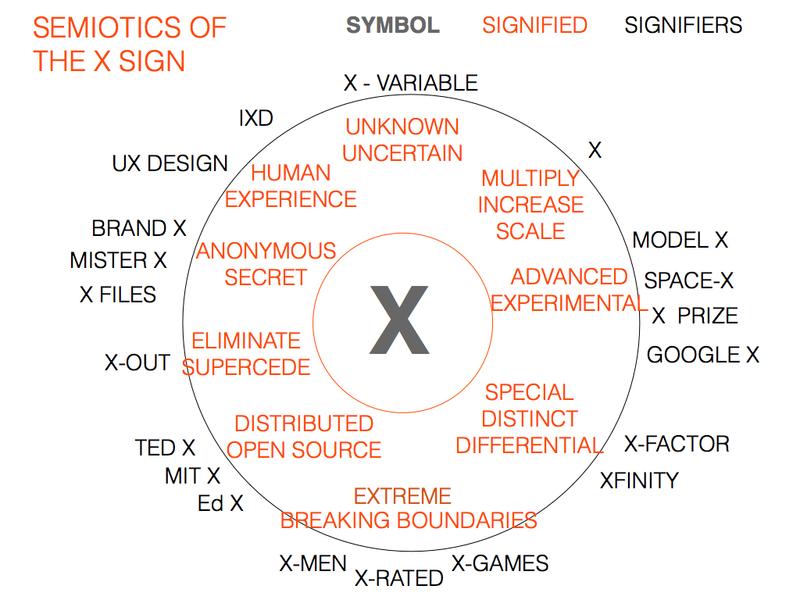 What is the “X” about? How can one explore an ill-defined problem space? How did DEXIGN get here? Where are we heading? 4:45-5:15 EST WHO ARE YOU? Student dyads interview and introduce each other making a concept map of each other to explain to the class who their partner is. 5 minutes to interview each other and 1 minute to report back on each person (5+5+20). Post concept maps on the wall. 5:15-6:00 EST WHAT DO WE MEAN BY “COOL DESIGN” ? Ground to 15K GPS signal unscrambled through executive order by Bill Clinton in 2000. GPS chips now in many smartphones (e.g., iPhone, Android). 15K Japan creates new safety standards for nuclear plants, requires nuclear plant safety upgrades, and proposes turning on nuclear plants. Study suggests Fukashima plant has been leaking for 2 years. 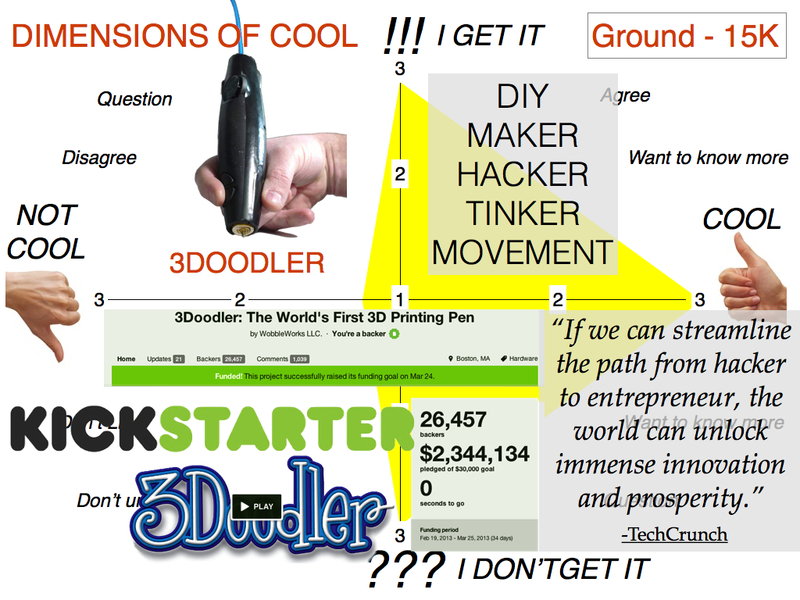 20K-30K TED community, mashup with Instructables, Maker magazine, Gizmodo, KickStarter, etc Massimo Banzi TED talk. 6:00-6:30 EST Working Break: Find your Cool Design examples. Student dyads have a 10 minute scramble to find their own COOL DESIGN examples. Dyads present & discuss their one-minute examples using the HEURISTIC DESIGN FRAMEWORK (10+10+20). Designers reading for understanding: Concept maps and beyond. 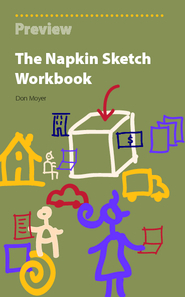 Using Don Moyer’s 17 Information Structures. Students are expected to make sense of data and ideas and find stories they find interesting. One method involves asking the six questions (i.e., who, what, when, where, why, how). Another method involves sketching the relationships that exist between and among concepts, stakeholders, and issues, which helps students see a topic from multiple perspectives and determine other research questions. Moyer’s seventeen ways to structure information: (Moyer, 2010). Just show it relies on making a drawing of physical things that are easier to understand through a drawing than a verbal description of the relationship between parts (e.g., how to set a table, the parts to a watch). Blob diagrams (a form of Venn diagrams) illustrate boundaries and overlaps and relationships between things. Hierarchies show the relationship between president and staff, parents and children, and so forth. Timelines order events on a linear scale. Vignettes through time show key details through time much like comics, graphic novels, storyboards, and movies. Quantity graphs such as line graphs, bar charts, and pie charts tell stories about quantities. Location maps show things in relationship to each other in space. Process diagrams illustrate the sequence of steps in many natural or artificial systems (e.g, distribution chain). Stock and flow diagrams illustrate mechanisms and flows in complex systems (e.g., worked hours, billable hours, and cash on hand). Swimlane diagrams show processes over time with multiple actors; each actor is represented as a lane; this type of diagram shows who does what, and where handovers between actors occur. Decision trees explain complex topics by diagraming answers to questions; binary decision trees use yes/no questions to map decisions. Web of connections describe the connections between actors, things, organizations, and places; usually such stories are easier to show than describe. Gradients show the order of ideas between two extremes (e.g., shades of grey between white and black). Comparisons involves comparing two or more elements (e.g., Dr Jekyl and Mr Hyde). Metaphors use what people understand to explain something that they do not; (e.g., life as a journey). While Moyer describes his information structures as aiding the visualization of big ideas. Students can use the structures to identify what they know about a topic (i.e., known knows) and in what areas they needed to do more research (i.e., known unknowns). For example, students can use simple information structures, such as a timeline, to visualize their current understanding of the evolution of the topic. The goal of making the timeline is to determine what they know about the topic, and what they do not know, and would like to learn. The act of making the timeline sketch allows students to visualize their knowledge and gaps in knowledge as well. 1. Articulate differences in the design practice as it relates to design 1.0, design 2.0, and design 3.0. 2. Articulate the kind of design practice that one is most familiar with, and the kind of design practice one aspires to explore in the course. 3. Use concept mapping to represent information from an interview. 4. Use 2×2 matrices to visualize information on Design 1.0 – 3.0. 5. Practice presenting current understanding of research materials to class. Prepare to discuss in teleconference with Collective Invention (CI) principals: Erika Gregory, CI President and Fiona Hovenden, VP for Research. What are your reactions, thoughts, questions. What we like, don’t like, question, would change, agree with, disagree with, don’t understand, want to know more about. Compare, Contrast, Evaluate, Good/Not good about Collective Invention and their work vs other innovation consultancies you know about. Compare & contrast with design work, projects, methods, tools you are familiar with; your own interests, aspirations for your own design career. How are these points relevant to you as a designer? Was there anything in the assigned reading that confused you? What was it? Would you recommend this reading to a colleague? Why or why not? How does this reading relate to the design projects you are working on? What are some limitations to the ideas in each reading? Does it apply in general cases or in particular ones? What are the exceptions? The story of the evolution of how designers think and work is to a great extent the story of who we hung out with. Historically, Design has evolved less from the center than at the edges where we bumped up against practitioners from other disciplines. In the 1950s and 60s, we worked mainly with engineers to create stuff. Beginning in the 70s we linked up with marketers to sell stuff. In the 70s there was also a fashion for design entrepreneurship. Some of us began to collaborate with business professionals. Around 1980 we began hanging out with human factors specialists, psychologists and sociologists. In the 80s we began to radically extend the reach of the field. Designers became purposively interdisciplinary, working with anthropologists, cultural ethnographers, software engineers, media developers, corporate strategic planners, other specialists in computer-human interaction (the human factors side) and human computer interaction (the computer science, technology, software side.) Isn’t that silly given the big overlap? From the 90s to the present we have become highly . A designer today will be fluent not only in traditional product and graphic design (some wags call it “toasters and posters”) but also in Interaction Design, Experience Design and Communication, Planning & Information Design. Since the mid-90s, we spend time with operations management, organizational design and knowledge management specialists. Some of us linked up with systems strategists and future scenario planners, finding we have a role to play in bringing 30,000 ft. long horizon strategic scenarios down to ground level so that organizations would know what to do about them starting monday morning. 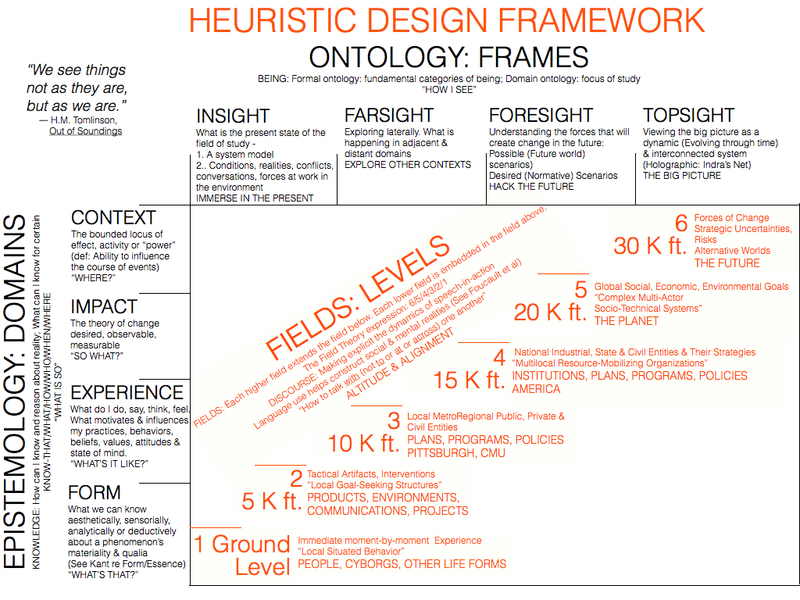 …and… to use conceptual frames that we will apply in this course: design has evolved From Intuition to Insight to Farsight to Forsight to Topsight. 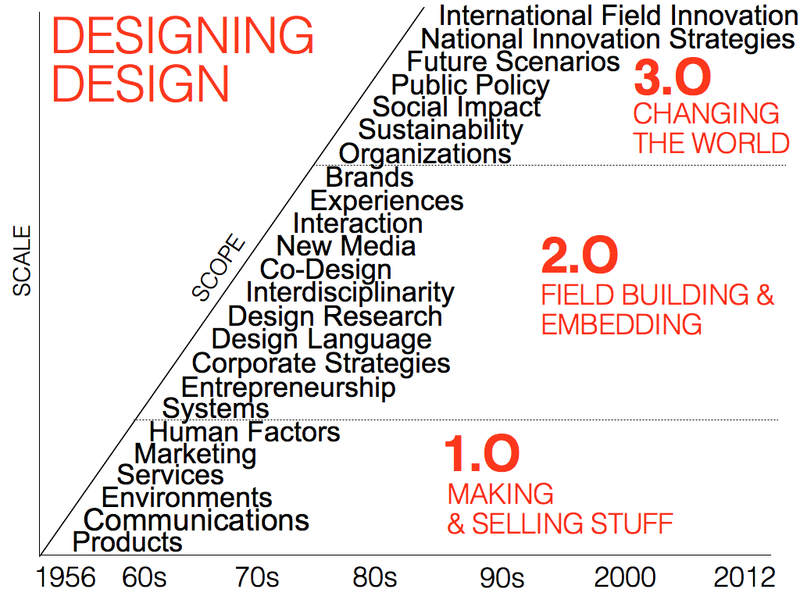 What design does over the next half century is entirely up to you. Those designers that choose to work further up the evolutionary ladder will be addressing more broadly defined, complex and diverse projects in an era of turbulence, disruption, exponential change…and golden design opportunity. It is the purpose of this course to explore the design proficiencies required to design the future in exponential times. 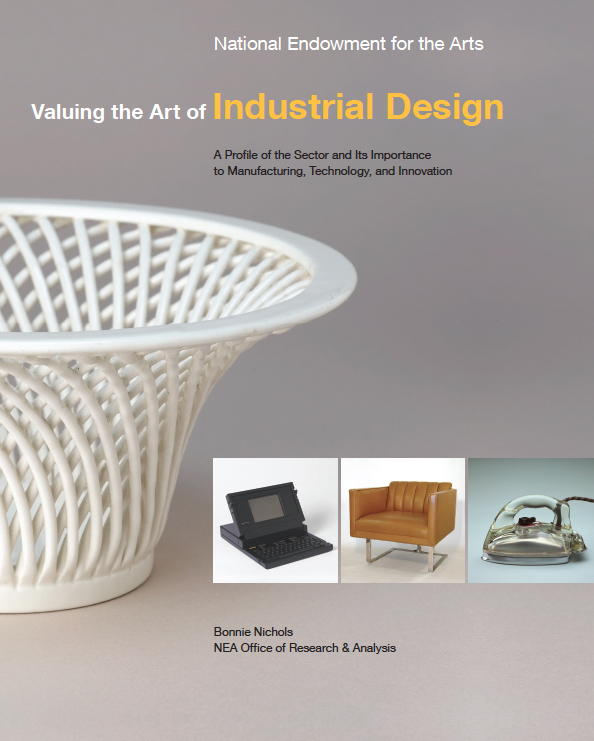 Which is not to say that the earlier modalities of design have disappeared. It is quite okay to create artifacts out of your personal intuition if that is what interests you. Not every designer has to design the future of the world. Just be aware that every design act from now on will in some measure be refracted through all the forces above it on the evolutionary ladder. To borrow a model from Field Theory, each higher field on this continuum extends the fields below it and each lower field is embedded in the fields above. The mathematical expression of that idea would be 3/2/1. 1. Neither the evolutionary path of design nor its present state are so neatly linear as I show here. A more apt representation would be an interdependent all-to-all holographic web, like Indra’s Net, the Buddhist model of universal interconnectedness in which every node reflects all other nodes. And we designers only further blur the epistemological boundaries of design by working as hard as we can to give away our most valuable asset – Design Thinking – to anybody that will have it. And that is where we stand today in the continuing project of Designing Design. How do you define a space? Take a physical space like this Graduate Design Studio. You define it by its dimensions. Not only by its most obvious dimensions, like its length, width and height, but by a plethora of other dimensions. For example, what are its sensory attributes – light, air, temperature, smell, acoustics. Or aesthetics – color texture, tactility. Or its affective factors – how it makes you feel, is it welcoming? Comfortable? Energizing? Aversive? Are the proxemics of the space Sociofugal or Sociopetal? What about its utility? What is its intended use and how well or poorly does it afford usefulness and usability? What about legibility? Is the room intuitively self-explicating or does it require a lot of instructions? Then there is the whole technological infrastructure of the space – and how well the technology affords the desired social dynamics of the learning programme. What about the economics of the space? The cost/value of building, running and maintaining it? Are there political dimensions to do with scheduling, administration, priority? Amenities? Spaces for intensive privacy, collaborative teamwork, serendipitous encounter? Now imagine the dimensions required to describe a more complex space, like a city in all its physical, social, economic and political complexity. 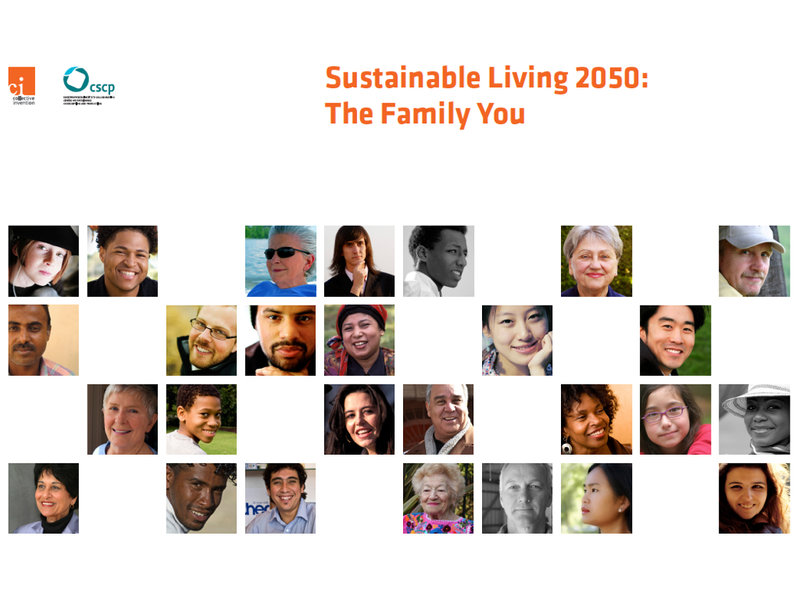 Or how about a conceptual space like Life in 2050? Or a problem space like designing Pittsburgh 3.0? Every designer knows that you have to do three iterations of a product to get the one that is ready for release – “ship it.” Here is why. Version 1.0 is based on fuzzy assumptions, constraints and definition of requirements. You can’t know how incomplete or faulty they are until you have something in hand to try out. Incorporating that knowledge, you figure Version 2.0 will be the right one. And 2.0 does indeed work pretty well. But it turns out to have unforseen side effects, epiphenomena and exogenous variables that you did not anticipate. So you need Version 3.0 that accommodates and manages for those externalities. These days, the demarcation between 2.0 and 3.0 has morphed into Perpetual Beta. Version 2.0 is released to get feedback from the field (think Siri or Google Glass) and rapid rolling upgrades give rise to a “satisficing” 3.0. Herb Simon distinguished between well-defined and ill-defined problems. A well defined problem has a pre-determined structure, a step by step procedure. You fill in the quantities and, like an algorithm, it outputs an end state. An ill-defined problem, sometimes called a “wicked” problem, has unclear structure, no predetermined procedure, no correct answer. In order to discover the shape and boundaries of the problem space, says Simon, you have to “go in anywhere” and work your way through by trial and error.